Guinness sponsors the Hurling Championship. 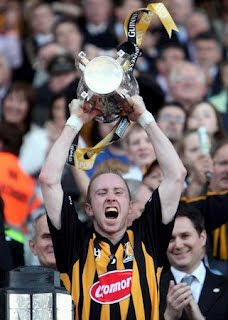 last year's All Ireland title. In an attempt to curtail drinking by young people the Irish government is considering a proposal to ban alcohol companies from sponsoring sporting events. Look, I'm as keen as the next 45+ year old to see fewer Irish people in their early 20s, late teens or even younger drunkenly stumbling around our streets at night, but that doesn't mean I see this as a problem that requires the government to "do something." First of all I'm not convinced the problem is greater now than it was 25 years ago when sponsorship was much less prevalent. My own observation was that when Ireland was awash with cash it was frequently in a drunken stupor. Now we're broke (again) and people are drinking less. Irish people drank 10% less alcohol per capita in 2011 than in 2006. It's possible young people are drinking less now than they did during the Celtic Tiger years. Regardless, young Irish people drink more than their peers in most European countries. It would be better if they drank less, but if the problem is no greater now than it was before alcohol sports sponsorship became the norm there must be other factors at work. That doesn't stop people like Minister of State for Health Róisín Shortall. Young people are drinking "too much" and she's going to marshal the forces of state and do ... something, even if it's the wrong thing. Hence the proposal to ban Guinness and others from sponsoring sporting events. The thinking is that young people are impressionable and sports stars are their heroes so when they see the captain of the championship team lifting the cup off a stand draped in Guinness advertising that's sending a message to the young fan that it's good to drink. I'm not going to argue that advertising and sponsorship don't work, especially on a subliminal level, but does a Guinness sign tell you to drink or to choose Guinness when you're buying that drink? I suspect the latter. Banning Guinness from sponsoring the Hurling Championship - probably the biggest Irish sporting event sponsored by an alcohol company - could well have more negative than positive effects on the health of young people. Guinness pumps a lot of money into the GAA through the sponsorship deal, money the GAA uses to develop facilities and promote playing their games to young children, teenagers and adults all over Ireland. The GAA gets people moving and the Guinness money helps with that. The Guinness sponsorship is probably a net positive for the health of the nation. Of course the government's proposal would only affect sporting events in Ireland. English and European soccer, rugby, golf and other major television sports that originate in other countries would be out of reach. So the government's ban would serve only to weaken Irish sports without really doing much about children and young people witnessing alcohol-sponsored sporting events. Besides, if the government is that worried about drinking and the susceptibility of star-struck young people why does it organize celebrity drinking events? 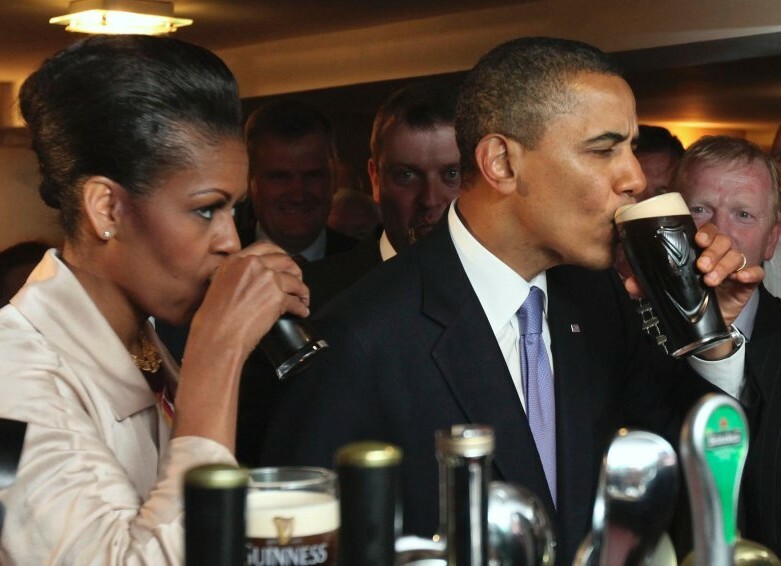 Last year we had two major ones: the Queen, who actually spurned the Guinness that was offered to her, and the coolest cat to visit Ireland in years - President Obama - were both invited to drink for the cameras. Without doubt the happy scenes of President and Mrs Obama downing Guinness in Moneygall would have had far more influence on young people than the sight of Kilkenny's hurlers lifting the championship trophy adorned with Guinness streamers. during their visit to Ireland in May 2011. If I were in charge of the GAA or any other Irish sports organization I'd tell the government to get its own house in order before coming after our revenues. If the government feels the need to "do something" they can start by not foisting pints of Guinness into the hands of every visiting world leader.